I definitely want to add Callpage, led by Ross Knap from Krakow to the list. Vivid-Q (based in Cambridge and London), has Aleksandra Pedraszewska is a co founder and squeaks in. Archdesk.co.uk led by Michal Mojzesz already had a mention, but they are now funded, and they continue to be a very high potential Polish Startup. Reality Games led by Zbigniew Woźnowski has rapidly growing revenue and has been pouring money into products that could be make 2019 a year of incredible success. For detailed and informed commentary about the Krakow eco system check Bartosz Józefowski’s (KTP) annual review here . For Krakow Startups check out the much improved OMGKRK database . OMGKRK Foundation is functioning very well under Paul Kulon’s leadership. I’m pleased to support it and be an Ambassador. This blog post started when my friend Ralph Talmont of TEDxWarsaw asked me for suggestions in preparing a speech- in answering his e-mail I ended up creating this blog post. This is both an aggregation of other lists – (disclaimer – where I have done this I am neither taking the credit for the work done, nor claiming that the startups listed are good companies – in the sense of providing clients with something fun or useful, creating good jobs, paying taxes and proving a return to investors). If you want to keep up to date with the startup community there are a few places to check regularly. My passive aggressive streak will take you here though this approach can lead you to strange EU funded lists like this. The best list of startups is here on Quora (note the total lack of government money). Hat tip to Borys at Reaktor Warsaw for this, it’s copy pasted below.. Ramon’s Tancinco gave this memorable TEDxKraków talk and build this free site which has a very good list including many startups. There are places where local communities find out what is going on, For example OMGKRK’s Facebook page, and the #OMGKRK hashtag for the community. Proseed magazine in Polish and Bitspiration and Mam Startup Goal Europe has regional news. Probably Techcrunch is a great place to look. Mike Butcher and John Biggs know more about our eco-system than most, and regularly visit. What is a great startup ? Getting funding is not the moment to declare victory. These thoughts led me here while capital remains cheap (and low commodity prices, a strong dollar and weak global demand mean that they probably will stay low for a while yet) high valuations in the Valley will encourage brave investments. I have not listed my investments – they are available on my Linkedin There is more than one way to skin a cat, and there is more than one way to make US$100 million, well described here How many startups put out a press release saying “we are cash positive “. Wiktor Schmidt’s Netguru are doing very well, but is it a startup? In my view, one the coolest companies in Poland was Integer’s Inpost/Paczkomaty – a world leader, who are busy disrupting retail, with strong first mover advantage, being part of Amazon and Ebay eco-system, chosen by Naspers (via Allegro) as a strategic partner. It was a startup in Krakow not so long ago, and they are conquering the world. They may yet cause the collapse of retail rents. In 2016 the company had a rocky period. in 2017 they were taken off the stock market. and handled 59 million parcels, growth of over 50%. Codewise is winning lots of awards and is making bucket loads of money. 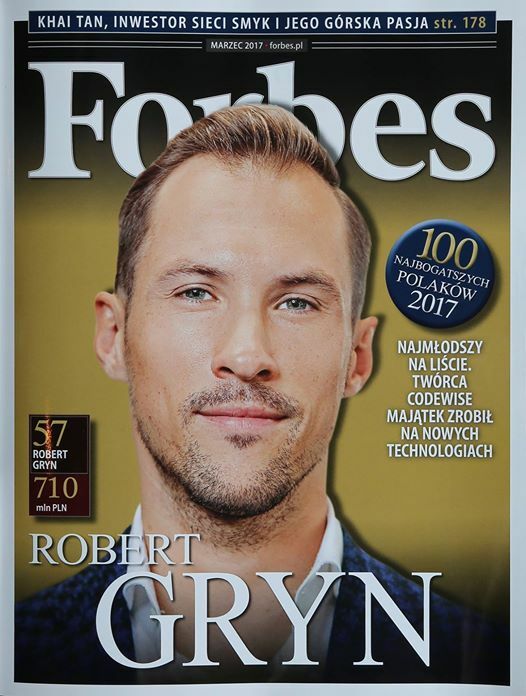 CEO Robert Gryn on the front page of Forbes Magazine moved to the US last year and is still growing the business without external capital. Krakow’s Brainly and Base both got over $30 mln investments. Base was acquired by Zendesk in 2018. I’m still not sure what Brainly’s business model is, but helping kids stuck with homework globally is a “must have” painkiller. They have 100 million unique monthly users, and raised US$38.5 mln. Following Gary Vaynerchuk’s line of thinking – if the currency of our age is attention, Brainly have it. My most popular answer on the Quora Q&A platform – answering Why is Poland less developed than Germany, Sweden and Russia? has more traffic than my post popular blog posts, showing the power of Q&A platforms. Brainly will do very well. Listen to my podcast with the CEO Michal Borkowski here. Base has a “must have product”, great design, but CRM is anything but scaleable, as anyone who has tried to deploy must know. I wonder how they will avoid adding complexity while giving clients what they need. Estimote (in which I am a shareholder), has been publishing news about its deployments in America and Asia with world leading companies, world famous museums, and has launched a video beacon integration. Most of their most interesting clients are NDA-ed. They are really close to very impressive clients. Kraków Eataway led by Mark and Marta Bradshaw has tremendous potential and clients in many countries. It can bring the economics of Uber and AirBnB with the values of Couchsurfing. CEO Mark was in front of the Project Kazimierz microphone for a podcast here and Marta was on the TEDxWarsaw stage in March 2017. Zalamo – the Polish market leading workflow automation productivity tool for professional photographers is doing well (I’m a shareholder) and has had another year of growth (we are looking for an on line sales specialist btw). Everydayiplay – is a little known Kraków games phenomenon with more than 2.5 mln downloads of its top ten Facebook game Vikings Gone Wild The CEO is now moving from digital to physical board games. If we are mentioned games then we need to point out Polish success stories like CD Projekt and if we talk about larger tech businesses in Poland, why not Comarch . How many tech entrepreneurs have created as much value ? Livechat in Wroclaw are growing fast, have great profitability and are in a market that can only get bigger and bigger. The updated Reaktor list by Borys Musielak . Go to Quora to see companies that feel left out adding themselves. Archdesk An all-in-one management & collaboration software with a focus on construction vertical. Tylko‘s Benjamin Kuna told me their App is one of the fast growing online furniture design brands in Europe. Crunchbase reports that they raised $3 million, so they must be doing something right. DocPlanner aka Znanylekarz – doctor rating site popular in Poland and neighboring countries by Mariusz Gralewski. They recently acquired competitors in Turkey, Spain and South America and raised a 20m USD Series C.
According to Predictions 2015: 3D printing is a revolution | by Deloitte, 10% of world 3d-printers are designed and manufactured in Poland, making us the market leader in that category. Sinterit As the name suggests Selective Laser Sintering 3D printing. If you like this answer and want to hear more about innovation and entrepreneurship in modern Poland and beyond try the Project Kazimierz podcast and leave feedback. Please let me know how I can help StartupPoland. Also, I urgently need exaples of already successful or dynamically growing PL startups that are not getting enough press, ie. not Estimote 🙂 Giving a talk about this next week. To learn more about interesting startups in Poland, follow @Polish_Startups on Twitter, watch other inspiring talks and check out the Bitspiration blog which covers new projects. Thanks for the excellent article about Polish startup market! I’d like to show you another inspiring one – TimeCamp, which is a company producing time tracking and project management software. Our time tracker is well-known and used by thousands of companies worldwide. Is it possible to contact you to discuss adding the company to your list? Please email me at o.rybacka@timecamp.com!